Shelia P. Moses. The Sittin’ Up. New York: G.P. Putnam’s Sons, 2014. Stanbury “Bean” Jones Jr. is excited to take part in his first “sittin’ up.” Now that he’s twelve, his parents agree that he’s old enough to be a part of the custom. A “sittin’ up” is equivalent to a wake. 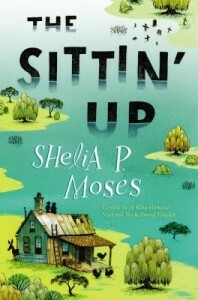 Novelist Shelia P. Moses explains in an author’s note that this tradition occurred in the town of Rich Square, North Carolina because after embalming, the undertaker would not keep the bodies of deceased black townspeople, so they were taken home the night before the funeral. The ritual of bringing the body home was phased out over time, however, the ritual of gathering of family and friends to honor the deceased remained. A “sittin’ up,” according to Moses, is held for the sake of living, to comfort those left behind and suffering from the loss of loved ones. The year is 1940, and the people of Low Meadows are still struggling with the economic fallout of the Great Depression. The novel opens with Bro. Wiley on his death bed. At the ripe old age of about 100, Bro. Wiley is at peace that his death is drawing near. He is ready to join his forebears in the so-called “Slave Grave.” That sentiment is not shared with the rest of the community. News of Bro. Wiley’s passing weighs heavy with grief and sadness. Although Bean is interested in the prospect of participating in his first “sittin’ up,” he feels regret that Bro. Wiley had to die. The novel focuses upon the process of preparing for Bro. Wiley’s sittin’ up. What should normally be a routine custom though goes awry with an impending storm that threatens to disrupt arrangements for the sittin’ up. No matter the forecast, Bro Wiley’s sittin’ up ends up being a transformative experience for Bean and the rest of Low Meadows. Moses’ story is driven by characters, their culture, and a strong sense of place. She covers plenty of ground in 226 pages. The Sittin’ Up addresses a number of small-scale community dynamics from the local outcasts like the town drunk, Real Kill, and Florenza, a flirty bootlegger who is busy making sweet eyes at Reverend Hornbuckle, to tensions between Bean’s father Stanbury and his lazy, lying brother-in-law, Uncle Goat. The novel touches upon historical elements like the enduring effects of the Great Depression and the economic and social environment of sharecropping. Moses also creates additional tension with the town school teacher, Mr. Creecy, who refuses to excuse his students, and Mr. Thomas Wiley, the landowner who wants the children to stay home and harvest crops. Racial tensions between whites and blacks are featured. Moses balances death and tragedy with life and new beginnings, and she explores the close bond between Bean and his friend Martha Rose “Pole” Cofield, and Bean’s maturation as a young adult. Moses includes an author note at the conclusion of the book, referenced at the beginning of this post. Read it first (there aren’t any spoilers) because it gives great context to the novel and it shows Moses’ personal experience as a native of Rich Square, North Carolina. In 2008, UNC-TV featured Moses on a half-hour Bookwatch segment. Read past blog posts on Moses’ work here. Shelia P. Moses. The Baptism. New York: Margaret K. McElderry, 2007. Twin brothers Leon and Luke Curry’s God-fearing mother thinks that it’s time for her adolescent sons to commit their lives to the Lord. The boys mean to do that, but the challenges of new family relationships, a trickster older brother, and the innocent temptations of summer in the rural South make it hard for them to give up their sinning ways. Racism, past and present, is part of Leon and Luke’s world, and navigating that adds tension and depth to the novel.